​Who Is The Loc8tor Pet Cat Locator For? ​What Animal Does Loc8tor Pet Locate? ​How Is The Loc8tor Pet Attached & Is It Easy To Use? ​Does Loc8tor Pet Withstand The Environment? ​Is The Loc8tor Pet Waterproof? ​How Many Pets Does Loc8tor Pet Track? ​Which Devices Is Loc8tor Pet Compatible With? ​Are There Any Other Costs After Purchase Of The Loc8tor Pet Tracker? ​What Is The Battery Life Of The Loc8tor Pet Like? 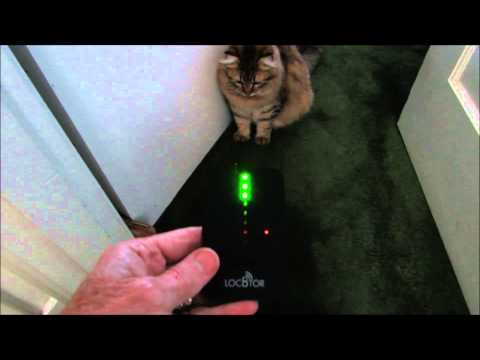 Loc8tor Pet Handheld Finder Locator For Cats Price - Is It Worth The Money? This device has been specifically designed to help locate your cat (or other small animal) in their hiding places. It's claimed to be the world's leading cat finder. ​Given the compact size and light weight of this cat tracker it's also highly recommended as a kitty tracker. ​You use the credit card-sized slimline handset to find your cat and its the best directional handset on the market with dual directional technology. ​What makes this unique is that you will receive both a visual and an audio cue to help you find your cat. Bear in mind that this does not operate as a cat tracker gps. It's much like a game of "hot" or "cold" and claims to be able to lead you to within 2.5 cms of your cat. ​All you need to do is press the call button and follow the beeps and lights until you're reunited with your furry friend. ​If you're a cat owner you know they really do have nine lives and get into all sorts of scrapes and bother on a day to day basis. The patented location technology has pinpoint accuracy so it will be able to find your cat whether it's hidden deep in a bush, sleeping under your bed, stuck up a tree, stuck in a cupboard in the garage -- or even more obscure places. If your cat is in range you should be able to find them quite easily. ​This pet tracker is able to track your cat up to 400 feet or 122 metres in clear line of sight. This means you should be able to find your cat inside your house, up your neighbour's tree and down the street. Most cats are very territorial and don't stray too far. However, if you know that your cat goes completely awol when they get outside this may not be the best cat tracker for you. In that case, read my review about this popular cat tracker here. ​GPS trackers need to be regularly charged but not this gps cat collar. This gps collar for cats will work for many, many months (up to 7 months). Also the batteries are cheap and you also receive two homing tags in the one pack so you've always got a spare when you need one. ​If you use this before you feed your cat they will soon associate the discreet beep with food and, more often than not, return home promptly for dinner. It is super light weight. It weighs just 0.175 ounces so it your cat will hardly feel a thing. The Loc8tor mini homing tags only take a few seconds to attach it to your cat's collar and it comes with a splashproof case so that when it's near water or drinking its function won't be affected. ​The device can be used in any country as it works on a 2.45GHz frequency and a multi-language user guide is included. It's specifically been created for cats but other animals such as dogs, tortoises, ferrets and even free range chickens have all been happy customers. ​It tracks smaller animals with ease such as cats, dogs, ferrets, tortoises, chickens. It's very small in size and extremely lightweight. ​First you have to be sure to register the tag to the specific handset and then just insert the tag into the splashproof tag case included. Then just attach that with the split right to your pet's collar. ​Yes it does with the help of the splashproof tag case for protection. ​The tag itself is not waterproof. However, it is water resistant when in the splashproof casing provided. ​It will track up to 4 pets. 2 homing tags are included with your pat so you can track 2 animals right away and you can purchase an additional two mini homing tags quite inexpensively. ​It actually doesn't work with any devices like a mobile phone or computer. It works through the handheld device that is included. ​No, there are no additional costs after purchase as you do not need to use a cellular network. ​Its battery life is nothing short of incredible, claiming to last for as many as 7 months. It is really set and forget technology. ​The tag weighs only 5 grams. The tag is 30.5mm (h) x 19.5mm (w) x 8.5mm (deep). The handset is the size of a credit card. ​Cat owners around the world are huge fans of this technology. It doesn't rely on a cellular network to work so there are no ongoing fees. It's also able to be used throughout the world due to the tracking technology used. When you purchase the kit you will instantly be able to track two animals, with the option to purchase two additional homing tags for additional pets. The handset directs you to the precise location of your cat with pinpoint accuracy rarely seen which makes it much easier to locate your pet in hard to reach places. Unlike other tracking devices, not only can this be used to locate other valuables such as keyrings, mobile phones and tv remotes, but it can also be used to train your pet to return home whenever you want it to. It is the smallest and lightest tag on the market and is therefore suitable for a larger range of animals than with other pet tracking systems. The battery life is exemplary and lasts for many months so you won't have to recharge your device every few days like with some other trackers. You can train your cat to recognise the beep as a signal to come home ie for dinner etc. One cat owner mentioned that he lives in an open woodsy area and he manages to find his 2 cats on a daily basis with this cat locator. ​You cannot set up a safe zone and receive alerts when your cat has wandered off so it is more of an after the fact locator rather than a device to actually prevent your cat wandering off. You won't receive maps and directions on any devices, you just have to rely on the "hot" and "cold" sounds to help guide you. It is not a pet activity tracker. Some cat owners questioned the range of the device and that in fact it can be much smaller than claimed on the website rendering it not suitable for their purposes. One pet owner suggested the manual should have a troubleshooting section which is currently missing. TIPS: Here are a couple of tips that you may find useful. If the silicone cover is muffling the beeping sound then take a razor blade and just make a small circular hole and that should help. Make sure to always have extra batteries so that your device is never out of action. If the product stops working then check the batteries in the collar not just the remote. ​My review is based on extensive research online and spending considerable time reading reviews from people who have used this pet tracker. I have indicated some of the pros and cons of this pet tracker up above. This specific model is relatively new. There are a vast number of reviews for the Loc8tor Pet locator for cats and they are overwhelmingly positive. Without a doubt cat owners love the fact that their cat now recognizes the beeping of the locator as a sign that their owner is looking for them for one reason or another. More often than not the cat happily returns home when this happens. The silicone collar unit protector is another great feature owners love with comments that in heavy downpours and even in deep snow that the unit inside has remained totally dry. The combination of low price and extensive features are attractive to pet owners. When I delve into a particular cat locator such as this one it's not always possible to try it myself so I spend considerable hours -- sometimes days -- researching the tracker in detail by going through various product review sites, reading manuals, going to the manufacturer's website and also relying heavily on what actual buyers of the product have loved about the product and what needs improvement. I have found a considerable number of reviews from buyers who love it and have one on all their cats and have used them for a number of years. If you have a cat and are looking for a quality cat gps collar then look no further. The pinpoint accuracy is beyond compare, however, it seems at times the range can let you down in certain circumstances. I very happily give it a 4 out of 5 star rating. Loc8tor Pet Handheld Finder Locator For Cats Price – Is It Worth The Money?